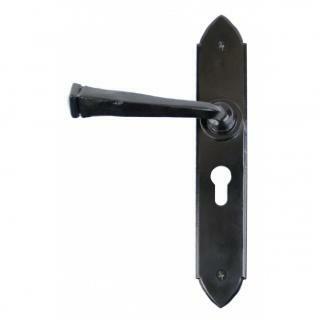 The Euro version of the Gothic handle is designed to be used in conjunction with a Euro Sash Lock and Euro Cylinder and allows your door to be locked from inside or out. Ideal for patio doors or replacement of existing Euro handles. 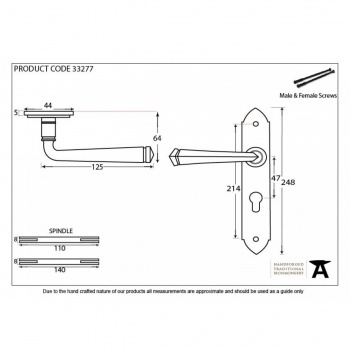 The handle incorporates a strong spring mechanism, has centres of 47mm and will only work with a Euro Sash Lock (see above link). For standard doors a Euro Cylinder of 35/35 (70mm) would suit but if your door is thicker than 50mm you will need a longer cylinder. Suitable for internal or external use but maintenance instructions must be followed to preserve the finish of your product.